My mom loved to crochet. She crafted beautiful scarves, blankets, hats, hotpads, dishcloths and more. I never fully appreciated the work that went into creating these works of love. When my mom passed away from Leukemia last month, I decided I would teach myself to crochet in memory of her. I joined a ton of Facebook crochet groups and read what I could about it. I was on a mission to figure crocheting out. It didn’t take long before I was able to do the basics. I couldn’t believe I was actually crocheting and teaching myself to do it. Of course, I wasn’t all alone in my adventure, I had YouTube to help me. 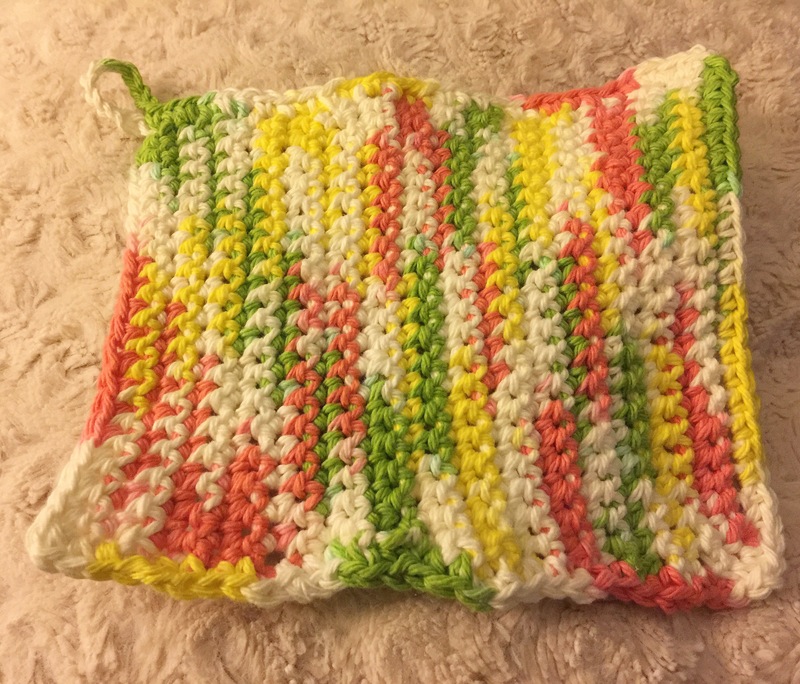 I recently completed my very first project-a dishcloth with a small loop to hang it from. It was silly of me to add that loop since I don’t have any hooks near our sink, but I like small details. It isn’t perfect, but I learned from it and I’ve already started another dishcloth. This one will be a gift for my mother in law. I’m excited to get this one finished and move on to a new project. I’m thinking a mug cozy or earbud holder might be next. For those of you who don’t crochet, I highly recommend looking into it. I find it very relaxing and a good way to cope with the grief from my mom passing. Also, Crochet Concupiscence has a ton of links to articles about how beneficial crocheting can be. How lovely! So special that this act of creation brings back forgotten memories of your mom! I love the story and that you gave it a try. YouTube is my go-to place to learn, you will find everything from very beginner to pro videos and tutorials. Check out hopeful honeys channel if you haven’t already, she is amazing! Thanks Susi! I will check out that channel.